Mr. Crafty requested a butternut squash pie for Thanksgiving. I had not made a butternut squash pie before, but it sounded delicious. 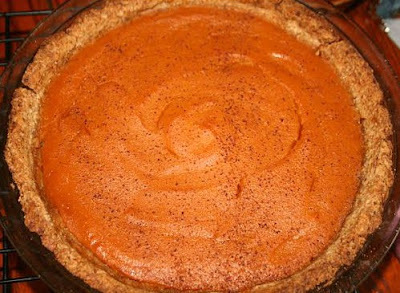 I decided to do it as I do pumpkin pie, but leave out most the spices, so the squash flavor could really shine. I also thought that the nuttiness of almonds and the heartiness of whole wheat would make a great crust for this type of pie. The pie was a hit and I'll be making it again soon! The texture was much smoother than any pumpkin pie I've had and it paired deliciously with the nutty crust. Combine flour, almond meal, sugar and salt in a bowl. Mix in shortening and earth balance until small crumbles form. You can use a food processor or do it by hand. Add in ice water little by little, just until dough comes together and forms a ball (you may not need all water). Place dough into a oiled pie pan and press out evenly. Bake about 10 minutes or until crust is golden brown. Combine all ingredients except nutmeg in a blender and blend until smooth. Pour into pie crust, sprinkle lightly with nutmeg and bake for about 40 minutes or until filling is set. *Note* You may need to cover the outside of the crust with foil, so that it does not become over done or burnt. Allow pie to fully cool before cutting.